Accompanied by an adult. "Accompanied by an adult" means within visual and voice contact and under the effective control of a child's parent or guardian or another person 21 years of age or older. Antique Snowmobile. "Antique Snowmobile" means a snowmobile more than 25 years old that is registered as an antique snowmobile under section 13104, subsection 5. Cowling. "Cowling" means the forward or rear portion of a snowmobile, usually of fiberglass or similar material, surrounding the motor and clutch assembly. Operate. "To operate," in all its moods and tenses, means: When it refers to a snowmobile, to use a snowmobile in any manner within the jurisdiction of the State, whether or not the vehicle is under way. Owner. "Owner" means: For the purpose of registration of a snowmobile, a person holding title to a snowmobile or having exclusive right to the use of a snowmobile for a period greater than 30 days. Private Way. As defined by Title 23 §1903-10-A, "Private Way" means a private road, driveway, or public easement. "Public easement" means an easement held by a municipality for purposes of public access to land or water not otherwise connected to a public way, and includes all rights enjoyed by the public with respect to private ways dedicated to the public. Public Way. As defined by Title 23 §1903- 11 "Public Way" means any road capable of carrying motor vehicles, including, but not limited to, any state highway, municipal road, county road, unincorporated territory road, or other road dedicated to the public. Snowmobile. "Snowmobile" means a vehicle propelled by mechanical power that is primarily designed to travel over ice or snow and is supported in part by skis, belts, or cleats. Trail Grooming Equipment. See Registration of trail grooming equipment. The commissioner or agents of the commissioner shall act on behalf of the State Tax Assessor to collect the use tax due under Title 36, chapters 211 to 225 in respect to any snowmobile for which an original registration is required under this Title at the time and place of registration of that snowmobile. A. The person registering the snowmobile is not a resident of this State. Snowmobiles and snowmobile trail grooming equipment used directly or exclusively for the grooming of snowmobile trails and which are sold to incorporated non-profit snowmobile clubs are exempt from paying sale or use tax. D. The snowmobile is otherwise exempt from sales or use tax under Title 36, section 1760. This section and sections 13002, 13003 and 13005 must be construed as cumulative of other methods prescribed in Title 36 for the collection of the sales or use tax. These sections do not preclude the State Tax Assessor’s collecting the tax due in respect to any watercraft, ATV or snowmobile in accordance with such other methods as are prescribed in Title 36 for the collection of the sales or use tax. An agent of the commissioner shallpromptly forward all certificates submitted in accordance with section 13003 to the commissioner. The commissioner shall transmit all such certificates to the State Tax Assessor. When a law enforcement officer issues a summons for a violation under chapter 937, the officer may impound the snowmobile operated by the person who receives the summons if, in the judgment of the officer, based on actual previous offenses by the operator or other considerations, the operator will continue to operate the snowmobile in violation of chapter 937 and that operation may be a hazard to the safety of persons or property. The operator or owner of a snowmobile impounded under this section may reclaim the snowmobile at any time subsequent to 24 hours after the issuance of the summons upon payment of the costs of impoundment to the enforcement agency impounding the snowmobile. This chapter applies to the operation of snowmobiles in all areas that come within the jurisdiction of the State. An operator's license is not required for the operation of a snowmobile. The following penalties apply to violations of rules regulating snowmobiles or the protection and safety of spectators at snowmobile races. 1. Civil. Notwithstanding section 10650, a person who violates a rule regulating snowmobiles or the protection and safety of spectators at snowmobile races commits a civil violation for which a fine of not less than $100 nor more than $500 may be adjudged. 2. Criminal. A person who violates a rule regulating snowmobiles or the protection and safety of spectators at snowmobile races after having been adjudicated as having committed 3 or more civil violations under this Part within the previous 5-year period commits a Class E crime. 1. Operating unregistered snowmobile. Except as provided in this section, subsection 7 and section 13112, a person may not operate a snowmobile that is not registered in accordance with this section. A. A registration is not required for a snowmobile operated over the snow on land on which the owner lives or on land on which the owner is domiciled, provided the snowmobile is not operated elsewhere within the jurisdiction of this State. B. A registration is not required for a snowmobile operated by a commercial ski area for the purpose of packing snow or for rescue operations thereon, unless the snowmobile is required to cross a public way during that operation. C. Snowmobiles owned and operated in this State by the Federal Government, the State or political subdivision of the State are exempt from registration fees, but must be registered and required to display numbers. D. Registration is not required to field test repairs to a snowmobile if valid snowmobile repair shop number plates issued under section 13110 are affixed to the snowmobile during the field test and the snowmobile is not owned by the snowmobile repair shop or any repair shop employee. E. Registration is not required to field test repairs to a snowmobile when tested on the premises of the repair shop when the shop is open and the snowmobile is not owned by the snowmobile repair shop or any repair shop employee. See Snowmobile repair shop registration and license. 2. Application and issuance. The commissioner or the commissioner's designee may register, and assign a registration number to, all snowmobiles upon application and payment of a registration fee by the owner. The commissioner shall charge a fee of $1 for each registration issued by department employees. 3. Form of registration. The snowmobile registration must be in such form as the commissioner may determine except that the commissioner shall develop a single form of registration that can be used for the 3-day, 10-day, or seasonal nonresident registrations. 4. Fee. Five dollars from each registration fee collected pursuant to this subsection must be transferred to a special fund administered by the Off-Road Vehicle Division of the Bureau of Parks and Lands within the Department of Agriculture, Conservation & Forestry. The funds must be used to assist any entity that has a snowmobile trail-grooming contract with the bureau in the purchase of trail-grooming equipment. The funds also may be used for the repair or overhaul of trail- grooming equipment. Twelve dollars from each resident fee is transferred to the Snowmobile Trail Fund. Six dollars from each nonresident 3-day snowmobile registration, six dollars from each nonresident 10-day registration fee, and eleven dollars from each nonresident seasonal snowmobile registration fee must be transferred to the Snowmobile Trail Fund of the Department of Agriculture, Conservation and Forestry, Bureau of Parks and Lands. A member of the armed forces described in paragraph A who desires to register a snowmobile shall present certification from the commander of the post, station or base, or from the commander's designated agent, that the member is permanently stationed at that post, station or base. Registration fees for registrations pursuant to this subsection must be allocated as if the person registering the snowmobile was a resident of the municipality in which the post, station or base is situated. 7. Snowmobiles of nonresidents; Maine-New Hampshire Cooperative Trails. Maine- New Hampshire Cooperative Trails. Except as specifically provided in this subsection and notwithstanding any other provision of law, a snowmobile belonging to a nonresident may be possessed or operated by any person in this State as long as the snowmobile is properly registered in this State in the name of a nonresident owner of the snowmobile. Nothing in this subsection authorizes the operation of a snowmobile in a manner contrary to this chapter. A. A nonresident is ineligible to obtain a resident registration for a snowmobile owned by that nonresident. Snowmobiles and grooming equipment registered to federal or state entities, snowmobile clubs, municipalities or counties from bordering states or provinces and engaged in trail grooming may be operated without being registered under this subsection. Snowmobiles registered in either New Hampshire or Canada may be operated on any lake or pond that is partly in both the State and New Hampshire or Canada without being registered in the State. (2) Maine Trail ITS-80 as identified in the Evans Notch area of the White Mountain National Forest. C. Snowmobiles registered in another state or in a Canadian province may be operated without a Maine registration at a special event or festival organized to occur in this State if such operation is approved by the commissioner. An event or festival organizer must submit a request in writing to the commissioner at least 60 days prior to the event or festival and shall include a map of trails where operation will be allowed. 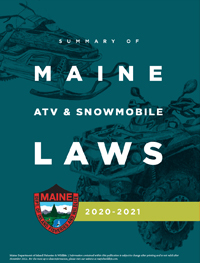 D. A snowmobile owned or under the control of a snowmobile manufacturer may be operated without a Maine registration at a demonstration event organized to occur in this State if such operation is approved by the commissioner. A snowmobile manufacturer or a representative of a snowmobile manufacturer must submit a request in writing to the commissioner at least 60 days prior to the demonstration event and shall include a description and the location of the event. E. The Commissioner may annually establish one 3-day consecutive period, 2 days of which are weekend days during which a non-resident may operate in the state a snowmobile that is not registered in Maine if the non-resident's snowmobile has a valid registration from another state or a Canadian province. Signs on Maine-New Hampshire Cooperative Trails. The Director of the Off-Road Vehicle Division of the Bureau of Parks and Lands within the Department of Agriculture, Conservation & Forestry shall work with the director of New Hampshire's snowmobile program to develop and place signs clearly identifying the Maine- New Hampshire Cooperative trails as defined in the Maine Revised Statutes, Title 12, section 13104, subsection 7. 8. Duplicate registration certificate. The holder of any resident or nonresident seasonal registration certificate issued under this section may obtain a duplicate from the commissioner upon application and payment of a fee of $1. 10. Transfer of ownership, discontinuance of use. The following provisions govern transfer of ownership and discontinued use. A. A person who transfers the ownership or permanently discontinues the use of a snowmobile having a resident registration or a nonresident seasonal registration and applies for registration of another snowmobile in the same registration year is entitled to a registration upon payment of a transfer fee of $4 and is not required to pay the regular registration fee. B. Whenever ownership is transferred or the use of a snowmobile for which a registration has already been issued is discontinued, the old registration must be properly signed and executed by the owner showing that the ownership of the snowmobile has been transferred or its use discontinued and returned to the commissioner within 10 days of the transfer or discontinuance of use. C. If there is a change of ownership of a snowmobile for which a registration has previously been issued, the new owner shall apply for a new registration, shall set forth the original number in the application, and shall pay the regular fee for the particular snowmobile involved. 12-A. Registration certificate, inspection, and display. (2) Display registration numbers in the form of stickers in such a form and manner as the commissioner may determine, except that an antique snowmobile is not required to display registration numbers. A person may operate a snowmobile registered online without displaying a registration number until that person receives the registration certificate from the department or for 30 days after registering the snowmobile online, whichever occurs first. Note: The registration stickers must be displayed on both sides of the cowling. 13. Fraudulent acquisition of snowmobile registration. A person may not obtain a snowmobile registration through fraud, misstatement or misrepresentation. 14. Report of destroyed, abandoned or permanently removed snowmobile. A registrant shall notify the commissioner if a snowmobile is destroyed, abandoned or permanently removed from the State. 1. Appointment of snowmobile registration agents; report; fees.Appointment of snowmobile registration agents and applicable fees are governed by the following. A. The commissioner may appoint municipal clerks or other persons who a municipality may designate as municipal agents to issue snowmobile registrations. The commissioner may designate other agents as necessary to issue snowmobile registrations. The commissioner shall determine by rule the period when the agents shall act. B. Agents may charge a service fee of not more than $1 for each snowmobile renewal registration issued and $2 for each registration covered by sections 13002 to 13005. This service fee is retained by the agent. (b) Order that the agency not be renewed for the next year. Rules adopted pursuant to this subsection are routine technical rules as defined in Title 5, chapter 375, subchapter 2-A. 2. Unlawful issuance of snowmobile registration.An agent may not issue a resident snowmobile registration to a nonresident or a nonresident snowmobile registration to a resident. (1) A person on a properly registered snowmobile may cross controlled access highways by use of bridges over or roads under those highways or by use of roads crossing controlled access highways at grade. (3) A person on a properly registered snowmobile may operate the snowmobile within the rightof- way limits of a controlled access highway on a trail segment approved by the Commissioner of Transportation or the board of directors of the Maine Turnpike Authority, as applicable. A. A properly registered snowmobile may be operated on a public way only the distance necessary, but in no case to exceed 500 yards, on the extreme right of the traveled way for the purpose of crossing, as directly as possible, a public way, sidewalk or culvert. B. A properly registered snowmobile may be operated on a public way only the distance necessary, but in no case to exceed 500 yards, on the extreme right of the traveled way for the sole purpose of crossing, as directly as possible, a bridge, overpass or underpass, as long as that operation can be made in safety and that it does not interfere with vehicular traffic approaching from either direction on the public way. C. A snowmobile may be operated on any portion of a public way when the public way has been closed in accordance with Title 23, section 2953. D. If the main traveled portion of a public way is publicly plowed and utilized by conventional motor vehicles, a snowmobile may be operated only on that portion of the way not maintained or utilized for the operation of conventional motor vehicles, except that operation on the left side of the way is prohibited during the hours from sunset to sunrise on the portion of the way not maintained or utilized for the operation of conventional motor vehicles. This paragraph does not apply to a snowmobile operated by a public utility regulated by the Public Utilities Commission while being operated in the course of the utility's corporate function, so that public utilities may effectively and speedily carry out their obligations to the public. E. A snowmobile may be operated on streets and public ways during a period of emergency when the emergency has been so declared by a police agency having jurisdiction and when travel by conventional motor vehicles is not practicable. This paragraph does not apply to a snowmobile operated by a public utility regulated by the Public Utilities Commission while being operated in the course of the utility's corporate function, so that public utilities may effectively and speedily carry out their obligations to the public. F. A snowmobile may be operated on streets and public ways in special snowmobile events of limited duration conducted according to a prearranged schedule and under a permit from the governmental unit having jurisdiction. G. Notwithstanding paragraphs A to F, a snowmobile may be operated on the extreme right of a public way within the built-up portion of a municipality or unorganized or unincorporated township if the appropriate governmental unit has designated the public way as a snowmobile access route for the purpose of allowing snowmobiles access to places of business. A public way designated by an appropriate governmental unit as a snowmobile- access route must be posted conspicuously at regular intervals by that governmental unit with highly visible signs designating the snowmobile- access route. Before designating a public way as a snowmobile- access route, the appropriate governmental unit shall make appropriate determinations that snowmobile travel on the extreme right of the public way may be conducted safely and will not interfere with vehicular traffic on the public way. For purposes of this paragraph, "appropriate governmental unit" means the Department of Transportation, county commissioners or municipal officers within their respective jurisdictions. The jurisdiction of each appropriate governmental unit over public ways pursuant to this paragraph is the same as its jurisdiction over the passage of vehicles on public ways pursuant to Title 29-A, section 2395. Municipal or county law enforcement officials having jurisdiction have primary enforcement authority over any route established under this paragraph. (2) Any bridge, culvert, overpass or underpass closed by the Commissioner of Transportation must be posted by appropriate notices. 9. Reckless operation of a snowmobile. person may not operate a snowmobile in such a way as to recklessly create a substantial risk of serious bodily injury to another person. B. Operating the snowmobile in a manner that fails to control its speed at all times as necessary to avoid colliding with any person, vehicle, snowmobile or other object on or adjacent to the snowmobile trail. 11. Operating a snowmobile at greater than reasonable and prudent speed. A person may not operate a snowmobile except at a reasonable and prudent speed for the existing conditions. 12. Operating a snowmobile while underage. A person under 14 years of age may not operate a snowmobile across any public way maintained for travel. 13. Permitting an unaccompanied child to operate a snowmobile. A person may not permit a child under 10 years of age to operate a snowmobile unless the child is accompanied by an adult. This subsection does not apply on land that is owned by the parent or guardian or on land where permission for use has been granted to the parent or guardian. This subsection governs noise level requirements for snowmobiles. (2) On the rear at least one lamp capable of displaying a red light visible at a distance of at least 100 feet behind the snowmobile. A. A person may not operate a snowmobile along or adjacent and parallel to the tracks of a railroad within the limits of a railroad right-of-way without written permission from the railroad owning the right-ofway. B. A person may not operate a snowmobile across the tracks of a railroad after having been forbidden to do so by the railroad owning the railroad right-of-way, or by an agent of that railroad, either personally or by appropriate notices posted conspicuously along the railroad right-ofway. C. Notwithstanding this subsection, a person may operate a snowmobile on railroad tracks if the person is operating within the right- of-way of a portion of railroad line that has been officially abandoned under the authority of the Interstate Commerce Commission. (3) On land the operator owns or is permitted to use. C. Trample or destroy crops on another person's land. 25. Headgear required. This subsection applies to snowmobile trails funded by the Snowmobile Trail Fund of the Department of Agriculture, Conservation and Forestry, Bureau of Parks & Lands. (2) May not carry a passenger under 18 years of age on the snowmobile unless the passenger is wearing protective headgear that conforms to the standards established under Title 29-A, section 2083, subsection 3. B. The Department of Agriculture, Conservation and Forestry, Bureau of Parks and Lands shall develop an administratively simple means of identifying trails that have been funded by the Snowmobile Trail Fund so that snowmobile riders can readily determine to which trails this subsection applies. 26. Operating snowmobile left of center of snowmobile trail. A person may not operate a snowmobile to the left of the center on a snowmobile trail that is funded in whole or in part by the Snowmobile Trail Fund when approaching or navigating a curve, corner, grade, or hill. For the purpose of this subsection, "snowmobile trail" means a trail that is at least wide enough to allow two snowmobiles to pass safely in opposite directions and where the snow over the entire width of the trail has been mechanically packed and groomed for the purpose of snowmobile traffic. A person may not operate any 4-wheeldrive vehicle, dune buggy, all-terrain vehicle, motorcycle or any other motor vehicle, other than a snowmobile and appurtenant equipment, on snowmobile trails that are financed in whole or in part with funds from the Snowmobile Trail Fund, unless that use has been authorized by the landowner or the landowner's agent, or unless the use is necessitated by an emergency involving safety of persons or property. Exception: ATV's with tracks, registered as snowmobile can be operated on a snowmobile trail. The owner of a snowmobile, the person who gives or furnishes that snowmobile to a person under 18 years of age and the parent or guardian responsible for the care of that minor are jointly and severally liable with the minor for any damages caused in the operation of the snowmobile by that minor. 1. Application and issuance. A person may not engage in the business of selling new or used snowmobiles in the State unless the person has registered as a dealer and secured a valid dealer's license from the commissioner. A dealer so registered and licensed need not register individual snowmobiles. For the purposes of this subsection, "new snowmobile" means a snowmobile that has not been registered in this State or any other state or for which sales tax has not been paid in this State or any other state if that other state taxes the purchase of a new snowmobile. 2. Fees. The dealer's registration and license fee is $15 annually from each July 1st. (2) For a nonresident dealer's plate, $60. B. Replacement for lost or stolen dealer's number plates may be obtained for a fee of $5 for each plate. C. If a dealer's number plate is lost or stolen, the owner shall notify the commissioner immediately. 4. Temporary registrations and numbers. The commissioner may issue temporary numbers and registrations for snowmobiles to bona fide dealers who may, upon the sale or exchange of a snowmobile, issue them to new owners in order to allow them to operate snowmobiles for a period of 20 consecutive days after the day of sale in lieu of a permanent number as required by this chapter. The fee for each temporary registration certificate is $1. 5. Display of dealer's number. Dealers shall display their dealer's number on each snowmobile being used until the sale of the snowmobile, whereupon it becomes the owner's responsibility to register the snowmobile. 1. Application and issuance. A person whose business includes repairing snowmobiles but who is not required to be licensed as a snowmobile dealer under section 13109 may register that business entity as a snowmobile repair shop and secure a snowmobile repair shop license and number plate from the commissioner. 2. Fee. The commissioner shall set the fee for a snowmobile repair shop license. The fee may not exceed $15 for any 12-month period. B. The snowmobile is not owned by the snowmobile repair shop or any person employed by the repair shop. C. Instructs each person who rents or leases a snowmobile how to operate the snowmobile, including how to use the brake, throttle and kill switch, and provides to that person a pamphlet describing proper hand signals. 2. Exception; guides. This section does not apply to a person lawfully engaged in guiding activities under section 12853 who accompanies others on guided trips that include the use of snowmobiles, except that such a person must provide the operators of snowmobiles with instructions equivalent to those described in subsection 1, paragraph C.
3. Fee. The fee for a snowmobile rental agent certificate is $25. The certificate is valid from July 1st to June 30th. 4. Prohibition; penalty. A person may not rent or lease a snowmobile in violation of this section. Notwithstanding section 10650 and section 13106-A, subsections 14, 15 and 16, snowmobiles operated at a prearranged racing meet whose sponsor has obtained a permit to hold such a meet from the commissioner are exempt from the provisions of this chapter concerning registration, noise, horsepower and lights during the time of operation at such meets and at all prerace practices at the location of the meet. D. Is performing snowmobile trail maintenance by plowing, leveling, or compacting snow by use of a front plow or rear attachments that include but are not limited to rollers, compactor bars, or trail drags. 2. Operating unregistered trail grooming equipment. Except as provided in this section, a person may not operate trail grooming equipment on a snowmobile trail that is financed in whole or in part by the Snowmobile Trail Fund unless that trail grooming equipment is registered in accordance with this section. A. A registration is not required for trail grooming equipment operated on land on which the owner lives or on land on which the owner is domiciled, if the trail grooming equipment is not operated elsewhere within the jurisdiction of this State. B. A registration is not required for trail grooming equipment operated by a commercial ski area for the purpose of packing snow or for rescue operation, unless the trail grooming equipment is required to cross a public way during that operation. C. Trail grooming equipment owned and operated by the Federal Government, the State, or a political subdivision of the State is exempt from registration fees, but must be registered and is required to display the registration. 3. Application and issuance. The commissioner may register trail grooming equipment upon application by the owner if the owner is a non-profit organization that has an approved contract for snowmobile trail grooming with the Department of Agriculture, Conservation and Forestry, Bureau of Parks and Lands, Off-Road Vehicle Division or a person that can provide proof to the department at the time of application that the person is a member of an organization eligible to register trail grooming equipment under this section. The commissioner may establish procedures necessary to carry out the purposes of this section. 4. Form of registration. The trail grooming equipment registration must be in such form as the commissioner may determine. 6. Fraudulent acquisition of trail grooming registration. A person may not obtain a trail grooming equipment registration through fraud, misstatement, or misrepresentation. Note: Qualified snowmobile trail grooming equipment is exempt from sales tax. Sales to incorporated non-profit snowmobile clubs of snowmobiles and snowmobile trail grooming equipment used directly and exclusively for the grooming of snowmobile trails. The season registration for a snowmobile is valid for one year, commencing on July 1st of each year. Fees listed below do not include the agent fee. A person may not permit a child under 10 years of age to operate a snowmobile unless the child is accompanied by an adult. This does not apply on land that is owned by the parent or guardian or on land where permission for use has been granted to the parent or guardian. This is a summary of penalties for snowmobile. For full language please refer to Title 12. §10651, 1-C – Failure to stop for a law enforcement officer. A person may not fail or refuse to stop any snowmobile on request or signal of any law enforcement officer in uniform whose duty it is to enforce snowmobile laws. A person who violates this provision commits a Class E crime. §13106-A, 9 – Reckless operation of snowmobile. A person may not operate a snowmobile in such a way as to recklessly create a substantial risk of serious bodily injury to another person. A person who violates this provision commits a Class D crime. §13106-A, 10 – Operating snowmobile to endanger. Operating the snowmobile in a manner that fails to control its speed at all times as necessary to avoid colliding with any person, vehicle, snowmobile or other object on or adjacent to the snowmobile trail. §13106-A, 11 – Operating snowmobile at greater than reasonable and prudent speed. A person may not operate a snowmobile except at a reasonable and prudent speed for the existing conditions. A person who violates this subsection commits a Class E crime. §13106-A, 20 - Abuse of another person's property. Trample or destroy crops on another person's land. §10902, 1 –Suspension or revocation of, or refusal to issue a license or permit. 1. You must stop at customs to cross a Canadian/U.S. border. The penalty for not stopping is $5,000 and loss of your snowmobile. 2. You must have a "Trail Pass" to ride Quebec and New Brunswick trails. In Quebec pick up your pass from the first club or the Federation of Clubs for Snowmobiles; telephone: (514) 252-3076. In New Brunswick pick up your pass from the first New Brunswick Federation of Snowmobile Clubs (NBFSC) checkpoint (on the trail) or arrange to purchase from the NBFSC, telephone: (506) 325- 2625; Fax: (506) 325-2627. 3. Trail 89/75 (Jackman) and Trail 85/19 (Fort Kent) crossing is open 24 hours/ 7 days a week. 4. Major ME/NB crossings are all open 24 hours/7 days a week. For local information contact: Ross Antworth, New Brunswick Federation of Snowmobile Clubs (506) 325-2625. A trail pass is required and you must have personal liability insurance, by New Brunswick law, on your snowmobile. The insurance can be from your state of origin and must be available for viewing if asked for by a peace officer. Collision, theft and fire insurance are recommended but not mandatory. 5. You must have your snowmobile registered, by New Brunswick law, in your state of origin. The commissioner shall establish the Snowmobile Trail Fund Donation Sticker Program. The commissioner shall design and issue 3 different Snowmobile Trail Fund donation stickers to reflect a donor's donation of $25, $50 and $100, respectively. For every donation $2 is retained by the department and the remainder is transferred to the Snowmobile Trail Fund of the Department of Agriculture, Conservation and Forestry, Bureau of Parks and Lands. During the annual Free Snowmobile Weekend a nonresident (from another state or province) may operate a snowmobile in Maine (no reciprocity necessary) so long as he/she has a valid registration from another state or province.